It seems to be a universal consensus that with the market marching higher good ideas are becoming rare. I agree, this isn't 2008, where literally buying anything that wasn't deep in debt did well, or 2009 where that strategy continued to work. My observation has been that obvious value is scarce, but there are pockets of the market where value continues to exist, smaller cap banking stocks is one of those pockets. In the past two bank primer posts I discussed a specific aspect related to bank investing, in this post I want to profile a cheap community bank. The bank is First Northern Community Bancorp (FNRN). There are hundreds of little banks like this, cheap and safe, First Northern was chosen almost at random, but it's a great case study. First Northern Community Bancorp is a small community bank located in Northern California. The Bancorp is a holding company for one subsidiary bank, the First Northern Bank of Dixon. The actual bank has a small number of branches, their first branch was established in Dixon in 1910. I value banks in a slightly different manner than most, I value banks like I value companies. I find a bank that's clearly undervalued, then I work to either confirm or deny the valuation. This is the opposite of someone who might research and value a company and once the valuation is done look at the market value. I start with the market value, I'm not looking for franchise companies, I'm looking for companies that appear cheap, and I want to confirm they actually are cheap, if so I invest. This means I don't have a watchlist of banks or companies I'd like to buy if the price were right. Rather I continually trawl low P/B stocks and pick up what's on sale that week or month. Keep in mind, this isn't the world's greatest bank, yet it isn't failing or losing money either. First Northern is a fairly stereotypical community bank. Given their situation I'd argue they should trade at least at book value, if not for more. There are probably as many ways to investigate a bank as there are bank investors, considering this is my blog you end up with my approach. I first like to take a quick look at a bank's assets, then quickly move onto their liabilities. My theory is if the bank has a costly funding structure, and onerous expenses it's not worth my time investigating the quality of their assets. To summarize, I glance at the assets and make sure nothing catches my eye, then I investigate their liabilities. 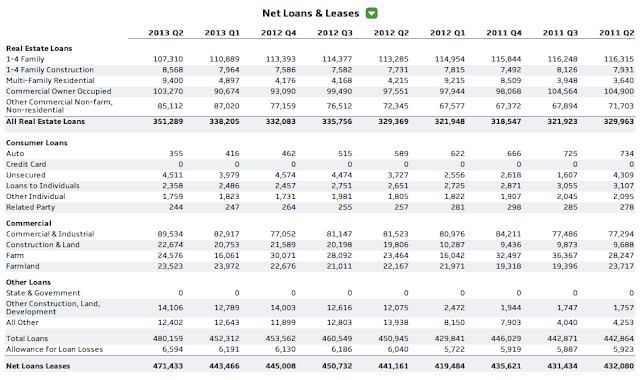 First Northern Community Bancorp's liabilities consist almost entirely of deposits, and a very small amount of 'other liabilities.' A bank has a few levers they use to affect their profitability, the cost of their funds, the rates at which they loan money, and their cost of doing business. For a community bank that mainly focuses on mortgage and consumer lending their lending rates are often set by the market. This means that expenses and deposits are the main factors driving profitability. In the case of First Northern most of their deposits fall into the category of retail deposits, that is deposits by retail banking customers. They have a low amount of brokered deposits, which are often costly. But simply avoiding brokered deposits isn't enough, more than half of First Northern's deposits are interest bearing. It appears most of the deposits are in low rate money market accounts, the bank is paying a .17% rate on all of their customer deposits. Examining a bank's loans is always interesting, there are many lenders like First Northern who make most of their money by lending residentially. The more interesting banks are the ones who are very creative in their lending and able to boost rates. FS Bancorp comes to mind, they're a Washington community bank that has a very strong lending program to local contractors, their rate on earnings assets is 6.09%, quite a feat, but not without risk either. Other banks will have a small but thriving business doing auto lending which is profitable, or investment management, or something else. Residential loans typically have the lowest rates, but are also safer. A $75k residential default is handled much easier than a $2m commercial default. Banks that can prudently lend commercially stand to earn more money, but also expose themselves to more risk. First Northern isn't a pure residential lender, they have a sizable exposure to commercial borrowers. They also have a somewhat sizable exposure to three risky categories, construction and land, farm loans, and farmland. All of those categories are famously cyclical, if the bank lent when the market was high their recovery in a crisis could be questionable. 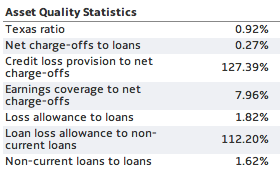 To determine if the bank is lending appropriately we need to look at their asset quality stats. There are two measures to look at, non-performing loans to loans, and non-performing assets to assets. First Northern has .92% non-performing assets/assets, which is a desirable outcome. 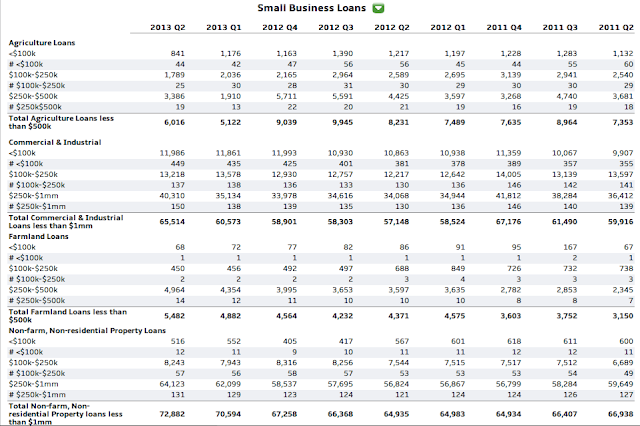 The bank's non-performing loans to loans ratio is 1.62%, higher, but not a number to be concerned about. There's also the possibility that the bank is over-reserved for loan losses, if this is true they could reverse their provision at some point in the future resulting in a sizable one time earnings gain. 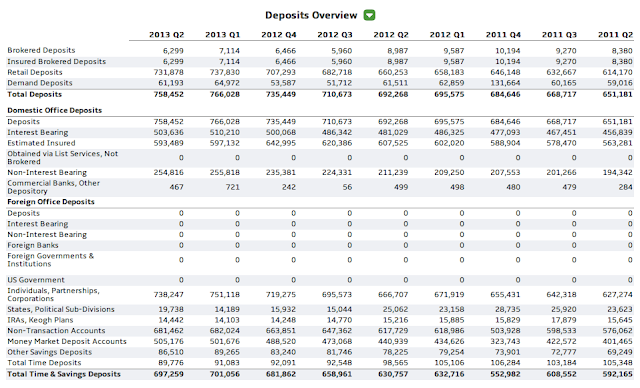 You may have noticed that almost this entire post I've avoided discussing the bank's earnings. A bank's balance sheet is paramount to their survival, a bank's earning power can be derived from their balance sheet. A bank with a poor balance sheet will have poor earnings, and a bank with a strong balance sheet will be able to generate strong earnings. Overall First Northern's balance sheet is average, and their earnings are average as well. The bank has been profitable seven of the last nine years losing money in 2008 and 2009 along with the rest of the banks in the US. The one last thing I want to mention with First Northern is their capital structure. The bank has common stock, no debt, and preferred shares outstanding. The bank took TARP funds during the financial crisis, and then used funds from the Small Business Lending Fund to repay their TARP sharse. 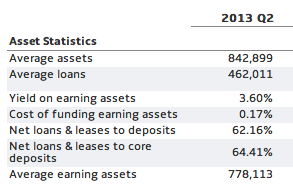 The bank initially issued $22m worth of SBLF preferred shares, of which they repurchased $10m in Q1 of 2013. In summary the First Northern Community Bancorp is not a franchise bank. They are a slow growing bank serving Northern California. They will never become a money center bank, and most likely will never have brand recognition outside of three counties, but even still they have a sound balance sheet, quality assets and are profitable. When all of these factors are considered together it's reasonable to say that the bank should trade for less than book value. They haven't destroyed book value, rather they've been growing it. I would never recommend building a concentrated position in a bank like First Northern Community Bancorp, but it seems like an investor could do very well building a portfolio position of 15-20+ banks with profiles like First Northern Community Bancorp. 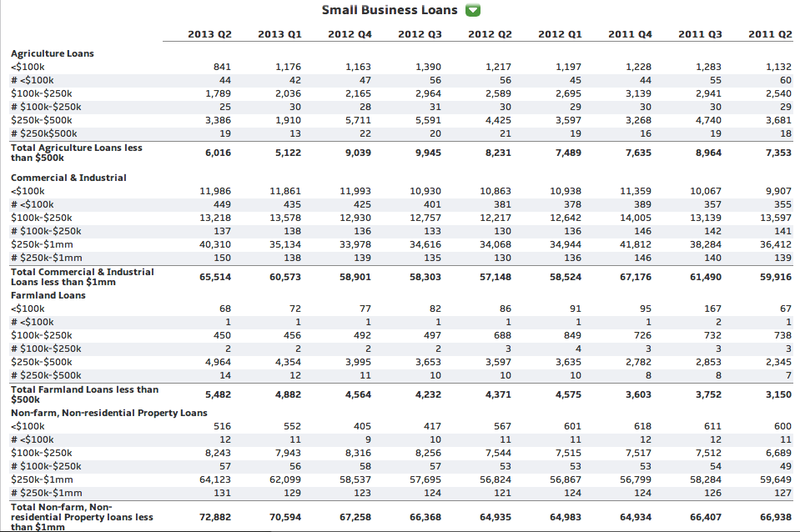 Nate, can you talk for a minute about what the differences are on terms between the TARP loan and the Small Business Lending Fund? Mostly just curious. My understanding is rough, but here's what I know. TARP preferred stock had a 5% dividend that jumped to 9% in 2013. Banks clearly wanted to be rid of the TARP stock before 2013 if possible to save on costs. The goal of the SBLF was that the government would buy preferred stock in small banks so that they would have more capital to lend. The program at first didn't have many restrictions on it, just the mandate to lend. A lot of these small banks took the funds received from issuing SBLF preferred shares and repaid their TARP funds. The SBLF had less restrictions and was cheaper, now many banks are in the process of repaying those funds. I saw an article on Inc. that mentioned that something like 50% of banks that received SBLF funds repaid TARP with it. The government didn't realize banks would slip through this loophole and has worked to stop it, but banks that did this already won't be penalized. Yes, there is LOTS of "alpha" to be generated in the community banking stocks. I did very well investing in them these last few years. On a slightly different tack, look at a very long term graph of JPM (which is a well run bank). There are HUGE swings in price. So the trick is, buy the banks in times of industry crisis. Wait for the recovery, hold them for a few more years, collect juicy dividends. Sell out gradually when things are going very well. In due time, the industry will make a mistake...repeat process....PROFIT! Seems reasonably valued to me unless I am missing something. Efficiency ratio is nothing spectacular. We could probably argue that they have over-reserved a bit. Selling at slightly less than book though, I don't know if there will be a lot of company-specific alpha left for the stock. Also if it is undervalued, I am curious as to why you don't own it? While undervalued, it wasn't undervalued enough for me to take a position. I see...but why should it trade for less than book value? Homasote: is it cheap or bankrupt?